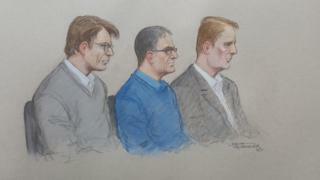 Mr Lewis told jurors at Southwark Crown Court that he took up his post at the beginning of September 2014. He said he had had numerous meetings with Bush and one with Scouler, but he was not told of the accounting issue until 19 September.He recalled he was called into a meeting with Adrian Morris, Tesco's chief counsel, at about lunchtime that day, and presented with a paper detailing the problem.Asked for his reaction to this, he told the court: "One of surprise and one of shock, really. "I think the thing that was unique to this paper was the indication that the numbers that had been declared had a potential misstatement within them. "What was new was the proposition here that ?246m of income had been included in the first half of the year that on that basis of this paper was deemed to be questionable." Mr Lewis said: "I had never experienced anything like this before, but it was quite clear that having read the paper, and the manner in which it was served, I felt that it had to be taken very seriously. "He said he called Tesco's chairman, Sir Richard Broadbent, and told him what the document said, and that a team of internal and external auditors was assembled to work through the weekend.Sir Richard returned from Italy, where he had been on holiday, and it was discovered by the end of the weekend that the shortfall was ?263m.Mr Lewis went on to explain the company had spent a great deal of time between Tesco's public announcement on 22 September stating profits had been overestimated, and when the company was due to issue its interim results on 23 October.He said: "It was a very intensive amount of investigation of these numbers. It required a huge amount of review of paperwork, documentation between pretty much all of the suppliers to Tesco and the different categories in order to validate the number. "So that was quite an extensive exercise. "At an earlier hearing, the court heard that two members of its finance department resigned in 2014 over concerns they may be compromising their professional integrity.The two were unhappy about what they were being asked to do by bosses.Carl Rogberg, 50, Chris Bush, 51, and John Scouler, 49, are alleged to have failed to correct inaccurately recorded income figures. The company's former finance head, managing director and food commercial boss deny charges of fraud by abuse of position and false accounting.The court has heard the three men were accused of "cooking the books" by bringing forward income not yet earned to artificially inflate its figures. Problems with Tesco's accounts came to light in a regulatory announcement in September 2014, when Tesco shocked the market in admitting it had overstated profits by around ?250m. Tesco has said it had incorrectly booked payments from its suppliers and has paid ?85m in compensation to investors who lost out when the share price fell in the wake of the accounting revelations.The trial continues.